All terms feared in the workplace. There are thousands of articles published on this research and millions of dollars invested in an industry of applications, platforms, and assessments designed to help companies avoid that bad hire. Why? Because hiring the right people really matters. The missing link? Hiring for emotional intelligence. The most successful hiring managers and organisations know that to make a GREAT hire takes much more than looking at resumes, experience, and even a solid interview process. It’s understanding the organisation, the people, and the type of people needed for success. Did you know 90% of top performers are skilled at managing their emotions? How an individual reacts in high stress environments can significantly impact the team and results. Those with higher EI understand when they need to take a step back and are less likely to blow up in a tough situation. People with higher EI are generally happier at work and more likely to empathise with and understand others. Remember that horrible boss that would spit and scream inappropriately at you? Yes, it’s likely he/she didn’t have high emotional intelligence. These people are more self-aware – willing to admit, address and work to avoiding future mistakes. They’re more resilient. Developing one’s emotional intelligence is a key contributing factor to becoming more resilient in work and life. When a person is emotionally resilient, they’re more likely to be able to maintain their productivity and performance in challenging times.Plus much much more! According to Harvard Business Review, “One of the reasons we see far too little emotional intelligence in the workplace is that we don’t hire for it. We hire for pedigree. We look for where someone went to school, high grades and test scores, technical skills, and certifications, not whether they build great teams or get along with others. And how smart we think someone is matters a lot, so we hire for intellect.” In the 20+ years since Daniel Goleman first released his book on EI, there’s been an abundance of research done on the connectivity between EI skills and desirable bottom line outcomes. The case for EI in hiring is clear. People with higher EI achieve significantly better outcomes that people with low EI. The World Economic Forum publish a new report every five years outlining the list of top skills essential for success in the coming years. EI has come in at number 6, and we predict it will be even higher in the next report. If you search “Hiring for emotional intelligence” or “The importance of emotional intelligence in hiring,” you’ll find an abundance of articles from hiring experts and psychologists on WHY it’s important, but not HOW to do it. That’s what we’re here to tell you about today. 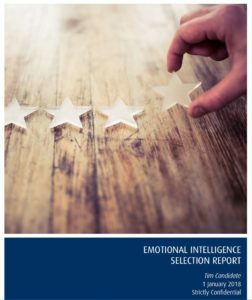 Genos International recently released a BRAND NEW Emotional Intelligence Selection Report. The Genos EI Selection Report and Model have been extensively researched and validated. 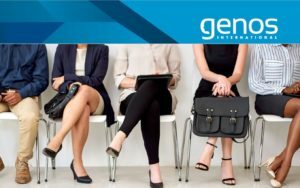 Results are presented in an engaging and readily accessible format with recommended interview questions and evaluation guides making the lives of your hiring managers easier. The simple and secure assessment platform is extremely easy to use to access surveys and monitor progress. The survey is timed, providing candidates with 30 minutes to complete. This survey includes sophisticated measures of distortion, inflated scores and inconsistent responding, and adjusts scores accordingly to ensure meaningful results are provided. Is it time to start focusing more on EI in your hiring process? If you’d like to learn more about this game changing new report, click here to watch the recording of the webinar. Game changing for your selection process, life changing for your new hires.